Take our tech for a test drive with an included trial of OnStar1 Safety & Security Plan and Connected Services including remote start and door unlock from your smartphone2 and SiriusXM Satellite Radio3 with your vehicle purchase. No cost. No commitment. No worries. Get the All Access pass every time you get behind the wheel. 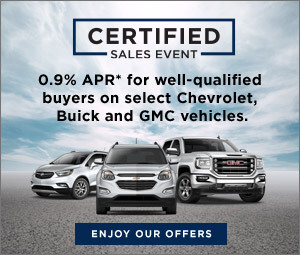 All of our satellite radio-equipped Certified Pre-Owned Vehicles come with three trial months3 of the SiriusXM All Access package. Listen to everything. Listen anywhere. Hear every channel available in your ride, including all of our premium programming. Plus, listening on the app and online is included, so you'll hear the best SiriusXM has to offer, anywhere life takes you. Eligible 2015 and newer vehicles receive 1 month of OnStar Safety & Security Plan coverage and 1 month of connected services, which includes navigation and Remote Access Plan, and 1 month or 3 GB of 4G LTE data (whichever comes first). Eligible 2011–2014 vehicles receive 1 month of OnStar Safety & Security Plan coverage and 1 month of connected services, which includes navigation services and Remote Access Plan. Services are subject to user terms and limitations, and capabilities vary by model. Certain services require working electrical system, cell service, and GPS signal. OnStar links to emergency services. When you select a paid monthly plan within 15 days of activation, you’ll receive an additional 2 months of the plan you select at no additional charge. The 2-month extension must be redeemed within 15 days of activation date and requires that you enroll in a monthly service plan and associate a payment method on file. After trial expires, OnStar will automatically bill your payment method each month. Plans containing 4G LTE data will be billed every 30 days by AT&T. You may cancel at any time by pushing your blue OnStar button or by calling 1.888.466.7827. Data plans provided by AT&T. Availability subject to change. Mobile app features require automatic locks and factory-installed and enabled remote start system. See onstar.com for details and limitations.